Wanna spruce up a pair of new white Converse kicks? 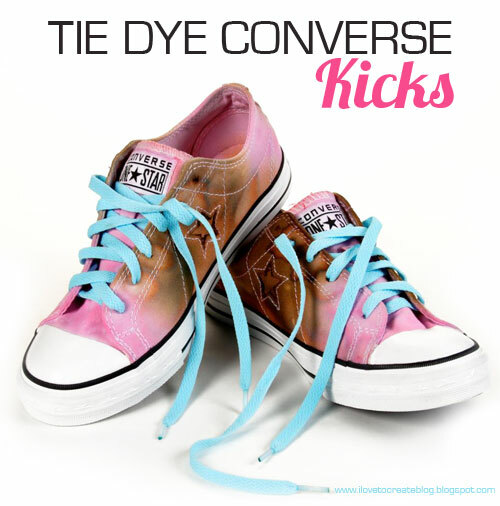 Make yours truly original with the help of Tulip® One-Step Tie Dye! iLoveToCreate designer Allee Marderosian created this pair with just a few simple products. Here's how you make them! 2. Mix up brown and pink dyes and pour them into a plastic bowl. Carefully use sponge brushes to sponge on dye onto fabric, being very careful not to get the dye on the rubber areas. 3. Cover the shoes and laces each in their own bag (as not to mix the colors). Let set for 6-8 hours. 6. Accent/doodle around selected areas with a black Tulip® Fabric Marker. Allee says you can do your own color combinations and play with the colors. If you're a little timid to try on a more expensive pair of shoes, you could always try this on plain canvas shoes until you are comfortable with your skills! i am very excited by seeing this Converse Footwear.Specially I like the color of shoes less.i will definitely gift buy this item to my special one...I enjoyed reading your article, many thanks….I love this whole look! You are amazing. That's a fun idea, I might have to try it out.